I learned several lessons yesterday. First, no matter how hard you try to get the blade tracking correctly on a bandsaw, if it's been neglected for over fifteen years and therefore the tires have gone bad, the blades gonna still fly off. Second, you can't joint a board on a jointer that isn't tuned correctly. Third, and final (at least for yesterday), you should probably wear shoes in the shop. I dropped a piec e of lumber on one of my toes and OUCH! Well, after getting Ken's jointer adjusted correctly I was able to get my boards faced jointed and get a square corner. Today I hobbled around barefoot (I did say probably should wear shoes) and cleaned an area to work in and I got the top and bottom of Bisket's serving stand rough milled and glued up. Even though I'm not to good at this yet, I'm having a great time. I went into the shop this morning when Sylvia went to church, turned on some Elton John, and started cleaning. You can actually see the floors again. As I said, I'm really not ready to start projects. 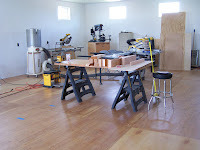 I need to build cabinets to house all my "stuff" and build some actual work stations (notice the door on sawhorses I'm currently using for a workbench). 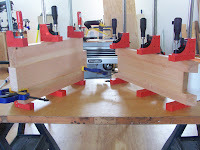 Those saw horses are the base for my "router table", too. I don't remember what I was thinking when I built the cabinet for the drill press. I must've been feeling very tall that day, 'cause it's built for someone that's over six feet. But the old girl takes precedent. I try to always remember "family first, then friends, then everything else." Once I get the final top and bottom of Bisket's stand cut to size I can figure out the dimensions of the "legs". I'll probably need to tune up my drum sander as it hasn't been used in about five years and it's been bumped around a lot. Looking good, Vic! 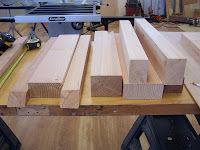 I'm not wild about milling lumber, but there's something very satisfying about seeing a stack of squared-up boards. Sylvia actually found a church that I may feel like attending. I'm not a big fan of "organized" religion. This is more like a "universal" church. Lots of lessons learned that day! I like your shop. I think your bench is great. All it takes is a solid and flat surface. Keep up the good work. It is a lot of fun seeing what you are up to in the shop and getting to know you.